The 2017 Cadillac XT5 was originally expected to be shown at a future US-based auto show, such as the 2015 LA Auto Show. But as it turns out, the midsize Cadillac SRX replacement will actually debut on the other side of the world, during the 2015 Dubai Motor Show happening between November 10-14. The 2015 Los Angeles Auto Show happens the week after, and we do still expect the new XT5 to be there. The teaser images released by Cadillac late last night certainly leave better impressions on us than the original spy photo that caught the XT5 fully exposed during a New York photo shoot. The crossover, based on the new Chi platform, will likely be front-wheel-drive-based, with an all-wheel-drive system available. The Cadillac XT5 has been described as a “computer on wheels” by some, and is expected to include Super Cruise semi-autonomous driving technology, and could be available to customers as soon as early 2016. 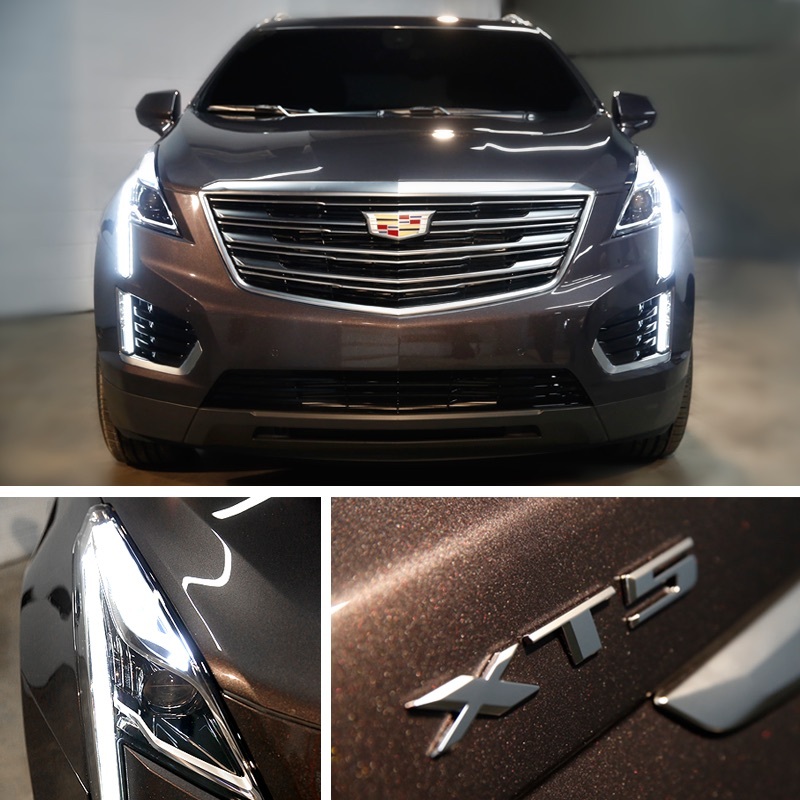 What’s more, the 2017 Cadillac XT5 may even offer a performance-oriented Vsport model, as well as a hybrid variant. There’s even been rumors of the XT5 offering up two different wheelbases. As for the engines, we could see anything from a 2.0L turbo, the new 3.6L LGX V6, and perhaps even the 400 hp 3.0L LGW twin-turbo V6 that will debut in the Cadillac CT6. We have two months until we know for sure. Actually, the XT5 made it’s US debut flying over Manhattan (via helicopter) last night to kick off ‘Men’s Fashion Week’. Yes, but there’s a difference between showing off the car with teaser images and videos and releasing the entire spec sheet of vehicle facts and figures. Right? In the meantime, we have airborne shots of the XT5, and the opportunity to buy a curated collection of Cadillac-wear. One can only hope this suit is available for purchase! The design is kinda meh! I hope it sells well and is well received. I had hoped that All future Cadillac models would be rear wheel drive based but it doesn’t look like that will be the case. To bad. Hopefully this will be the last FWD-based Cadillac vehicle. Use the Alplha platform for subcompact, compact and midsize crossovers and Omega for full-size crossovers. They provide a much better driving experience and allow for better design too. While the XT5 does look improved from the earlier set of leaked photos, I too believe the design is a little on the soft side of. Then again, most vehicles in this segment are not that radical either. The biggest standout is definitely the new Lexus RX! I actually think the XT5 will do well during the initial release, just like the ATS did; hopefully it’ll maintain the strong sales though. This is definitely a step in the right direction from Cadillac!!! I was worried about the grill in the leaked photos a couple months back, but this appears to be different and I love it. The detailing in recent Cadillac grills is exceptional. Cadillac has done a great job evolving the Art & Science design with this new generation of products. The LED lighting signatures are just stunning. If they could start playing with how the lighting activates (like Ford with the sequential taillights on the Mustang and Audi concepts) they could really take the lead in this field. Fingers crossed for the 3.0TT mated to AWD and an 8 speed. Hope the XT5 has similar seats that are in the SRX . The seats fit me like a glove , and thats hard to find when you’re 6’5″ . I know alot of folks here slam the SRX but I love mine and have never had any problems with it . One thing that GM has improved on is their paint . I have the Crystal Red Metallic and everyone who has seen it has complimented on the color . My Truck is Carbon Black Metallic and that too is a looker in the sunshine . Gone is the orange peel or plastic parts that don’t match the body color . Anyway , want to see a better pic of the rear end of the XT5 . In this segment its difficult to stand out in the crowd , having the faux tailfin lights helps to distinguish it from the others escpecially at night . I’m sure it will grow on me. I’ll wait to see it at GLAAS in November.